If you think that the story sounds familiar, then you’re probably right. Bord de Mer is the original title of Peirene Press’ first offering Beside the Sea, the English-language version being translated by Anthea Bell. It’s a dark book, both in its themes and its setting, with a large chunk of the novella happening at night and the rest during an overcast, rain-sodden day. Meike Ziervogel, the person behind Peirene, has been very vocal in her belief that knowing what happens at the end of the book adds to the pleasure of reading it. I can see where she’s coming from, but I think I’ll leave it up to the reader to work that out for themself – all I will say is that you shouldn’t read this if you’re expecting a happy ending. The anonymous mother narrates the tale, dragging nine-year-old Stan and five-year-old Kevin away from school for an unexpected trip to a small, out-of-season seaside town. It is an attempt to bring them a little pleasure in an otherwise bleak existence, but nothing goes to plan. The hotel is dark, the room is cramped, the streets are full of mud – and the rain falls constantly, soaking the family whenever they emerge from their bolthole, seeping into their clothes, their bones and their souls. The rain comes to symbolise the struggle the mother faces in her everyday life. Alone, raising two young boys, there is never a break in the metaphorical clouds; her life is spent under a constant drizzle, which gradually breaks her spirit. 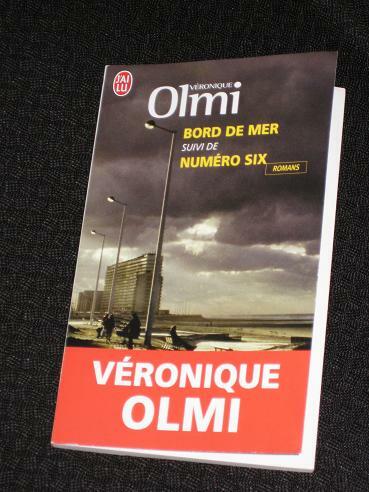 Bord de Mer is an interesting story, one which can be read in little over an hour, but it’s not one of my favourite Peirene titles, and I’ve spent a long time trying to work out why. One reason for my doubts have to do with the voice of the mother, a very simple, colloquial voice, one which makes the book easy to read. While the voice is accurate and extremely well done, it doesn’t really suit my reading tastes. It’s too plain and pales beside the writing in some of the other books I’ve been reading recently. The major reason for not loving this book though is that I found it extremely difficult to empathise with the main character, and I simply couldn’t understand why she did what she did. In many ways, Olmi has constructed the situation beautifully, avoiding any mawkish sentimentality by sparing the reader the details of any brutality or tragedy in the mother’s life. The flip-side of this though is that there are no excuses, no mitigating circumstances for what occurs, leaving the reader to judge based on the evidence of the text – and pretty damning evidence it is too. Beside the Sea is a book close to Meike’s heart, and picking holes in it does feel a bit like kicking someone’s puppy. It is a good book – I just suspect that I’m not the right reader for it. Which is not to say that I didn’t like it, because I did. Knowing what was to come (and most readers figure it out pretty quickly anyway), I felt the tension gradually build up, hoping in vain that everything would turn out alright, and then… The last ten pages or so, the release of all the pent-up tension, the horrific, clinical, detached culmination of all that has come before… That is what makes reading the book worthwhile. As luck would have it, on the night I finished Bord de Mer, the rain was lashing down here in Melbourne, and as I finished the book, my five-year-old daughter came in asking to be tucked in. Before putting her to bed, I gave her a big, big hug. # The English translations are my own efforts, not those from the Peirene edition. I've been wanting to read this ever since it was published in English. I think I understand exactly why it ends the way it does, and I'm really REALLY glad you can't empathise with the mother. That's a good thing, seeing as how you have beautiful children of your own. I read this earlier in the year. It is certainly not a picker-upper. That said, I found it a completely compelling, concentrated little novella, one that, as you note, avoids “mawkish sentimentality.” I wasn't as bothered by not knowing the why. I've known plenty of mothers driven to the edge, particularly during what one of them referred to as the “Arsenic Hour,” that late time of day when having been couped up with the kids all day one feels one just can't take it anymore. Beside the Sea was like an Arsenic Hour that never stopped. To borrow Virginia Woolf's appreciation of literature as “pushing further against the darkness,” here's a novel that does that – and finds more darkness. Too plain? I'm afraid I disagree. The simplicity of the prose is what makes this book so powerful. The reader never discovers why the woman does what she does, but is left to imagine this for themselves. I empathised massively with her – to do what she did she must have been in a desperate situation. This is the most powerful books I've ever read. I gave my boys extra big hugs on completion too! I'm not sure the reader's meant to sympathise with the mother. I certainly didn't. I found the reading experience to be like having an accident unfold in front of my eyes, while I was powerless to stop it. I disagree with you on the style part: she sounds real. She makes grammar mistakes, but not big ones, speaks with simple words, doesn't make any reference to complicated concepts. And I felt compassion for her, and even more compassion for the kids. Parenthood isn't easy and when my daughter was born, I remember thinking that it was such a rollercoaster of emotions that you'd better not have too big unsolved issues about your own childhood. It's disturbing because it kicks the common idea of motherly instincts. Count me as another fan of this one, but we can't all connect with every book. Then again, I thought Trainspotting excellent. If one doesn't enjoy the narrative voice though, the use of vernacular, it would I imagine just become tedious at best, at worst grating. Well, I certainly agree with Violet. I suppose I felt like you but for other reasons. I really couldn't relate or like her. Since it's been a long time since I've read it I cannot remember the voice at all. Let's hope you will like Numéro Six.